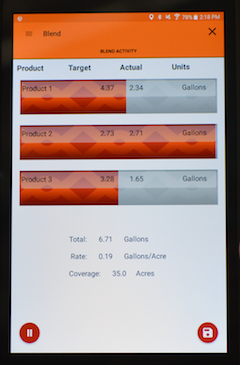 The Mixmate Android app controls the equipment in the field and captures the mixing data. The tablet or phone connects to the equipment through a Wi-Fi connection. The Mixmate Android app can be used with the Mixmate equipment or can be used stand-alone. The app is used to calculate and record the mixes. When the the app is used without an equipment connection, actual amounts can be recorded manually. When our Mixmate equipment is connected, the data is captured and recorded automatically. The app will also capture part of the records automatically and record manual inputs. An example of this would be when a Mixmate Flow is used for the bulk products and a regular inductor is used for any manually added products. The app has three major functions: control of the mixing operation, reporting, and setup. The mixing is very easy for an operator in the field especially when a prescription or job (work order) is set up ahead of time. The operator only has to select the job or prescription and verify the batch size to start mixing. The operator is prompted for any products that need to be manually added to a Mixmate Inductor. The measuring is done by the inductor and the actual and target amounts are recorded. One of Mixmate's patented features is the ability to adjust the batch for field conditions. A factor such as wind speed can adjust the amount of drift retardant or the size of a weed can adjust the amount of herbicide in the mix. The batch is automatically calculated according to the current conditions. The operator does not need to make decisions or do the calculations which reduces errors. This Mixmate App feature can also be used to manually enter a rate for a product to be mixed automatically. The field conditions are entered while verifying the mix info. The data recorded from the mixing operations would be of little value without a good reporting system. Data can be sorted and summarized many different ways. Some of the common filters are date, operation, location, and product. A PDF report can be downloaded or printed. Basic setup includes products, prescriptions, and jobs. Advanced setup includes system setup, facilities, transports, applicators, crops, conditions, etc. The system administrator can limit operators access to the basic and advanced setup sections. Android was chosen for several reasons. Rugged Android tablets are available. Rugged tablets can be exposed to the weather and washed. It is nice to be able to rinse a tablet off when exposed to chemicals. The Android operating system is much more user friendly than a Windows-based system. Software updates are very easy with the Mixmate system. The Android software updates come through the Google Play Store and can be installed automatically. Our app also will update the electronics used in the Mixmate hardware. The user only has to approve the software update and the system handles the rest. This is one of the great advantages of a cloud-based system. It is very easy to maintain. The Mixmate app is free and available on Google Play. “Get the job done. Don’t worry about the paperwork or the math. With Mixmate being able to calculate the acres and the gallons you don’t have to worry about that. You have enough to worry about between wind, being on the right field, right chemical for the right crop, you are driving an oversize load at 3 o’clock in the morning. The last thing I need to worry about is did I get it right.